You know the Mama Mama Mamas even if you've never heard of them. 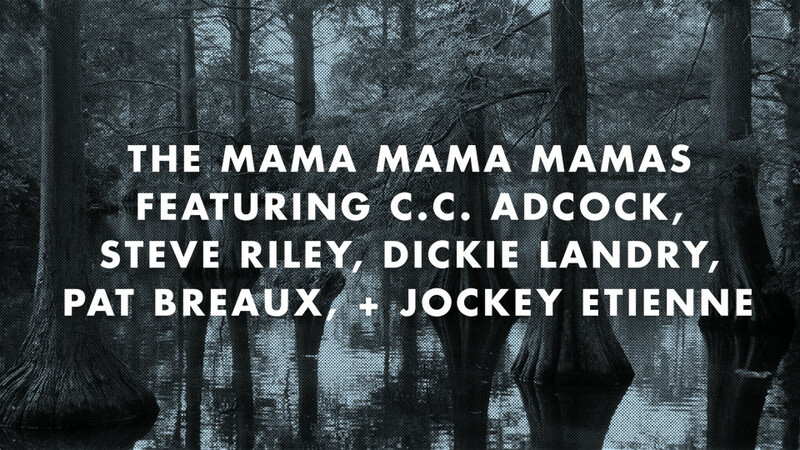 This south Louisiana all-star crew comprises several key members of swamp-pop supergroup Lil' Band o' Gold: Grammy-nominated Lafayette guitarist CC Adcock, who's played with everyone from Bo Diddley and Buckwheat Zydeco to Doyle Bramhall and Robert Plant to every swamp-pop legend in between; swamp-blues and zydeco drummer Clarence "Jockey" Etienne, whose pounding on cardboard boxtops created the murky ambience on '60s Excello classics by Lazy Lester, Katie Webster, and many more; Grammy-winning virtuoso Cajun accordionist Steve Riley; alto saxophonist Dickie Landry from Cecilia, La., who's played with Philip Glass, Laurie Anderson, Bob Dylan, Paul Simon, and the Talking Heads, in addition to creating acclaimed work as a photographer and painter; and tenor-sax titan Pat Breaux, who's played with numerous bands including the Red Beans and Rice Revue. Breaux is Cajun music royalty: His grandfather Amede Breaux is credited with writing the coonass national anthem "Jolie Blonde" in the 1920s. The Mama Mama Mamas are backing a virtual Mt. Rushmore of swamp pop at the 2015 Ponderosa Stomp: Tommy McLain of million-selling "Sweet Dreams" fame; East Texas swamp-popper Gene Terry, who cut "Cindy Lou" for Lake Charles' Goldband label; and Rod Bernard--in a very rare appearance--delivering his smash hit that took the nation by storm in 1958: "This Should Go On Forever," composed by Creole singer-songwriter King Karl.